When the wealthy and enigmatic art collector Harold Klimt moves into the long dilapidated house known as the Upshaw Mansion, most don’t think twice about it. But when Mr. Klimt begins to throw lavish parties for the town’s elite, Colin Thorne—a young, aspiring artist still grieving over the recent death of his childhood friend—sneaks inside the house to explore, suspicious something's wrong. What he finds are the buried secrets of a town with a troubled history and something else…a plane of horror so vast that it threatens to alter reality. Soon after that, Mr. Klimt offers Colin a job—painting a mural in the basement of the Upshaw Mansion. As Colin becomes more and more obsessed with the dark vision he is creating, the horror begins to bubble to the surface of not only his psyche, but the entire town. "Within is a violent, disorienting, and hypnotic tale--a tapestry woven with sinew, hope, and sacrifice. An unsettling read, Deininger casts a spell that stretches out over time, it's talons grabbing hold, and never letting go." 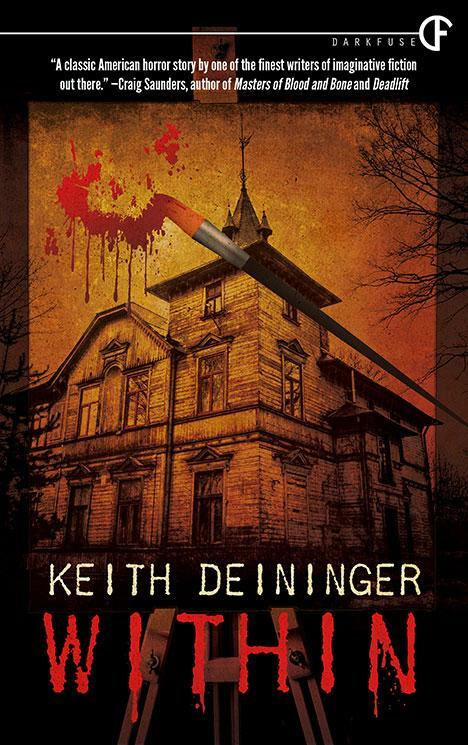 "Deininger's Within is a genuinely chilling tale of a town and people gone bad. A sense of detachment pervades the novel; a feeling that we, the readers, are no more than helpless observers as souls crumble all around us. Deininger puts us right there in the story, and with a sure hand takes us to a brilliant, dreadful crescendo, before leaving us with an ending as cold as ice. A classic American horror story by one of the finest writers of imaginative fiction out there." ~ Craig Saunders, author of Masters of Blood and Bone and Deadlift. "Another superb story from Keith Deininger, his writing seems to come from somewhere between dream and nightmare, between solidity and hallucination." "An atmospheric horror tale set in a small town with loads of weirdness... It is very creepy. It will definitely make your skin crawl. Keeps you gripped from page one to the last page. Bravo." "I loved this story--I found it imaginative, creative and fun... I highly recommend you check this out out! Just don't blame me for the nightmares." "Within is a horror novel with enough traditional horror themes mixed with a newer and edgier feel to appeal to every fan of the genre. Deininger infuses the tale with an almost dreamlike (nightmarish) quality that adds a surrealism to the story and keeps the reader guessing."